The founder and leader of True Word Prophetic Fire Ministry, Prophet Nigel Gaisie, known for his eccentric style of prophecy, has once again made a shocking revelation. 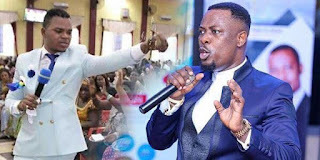 In an eighteen-minute video sighted by Remedi Entertainment, the self-acclaimed man of God revealed that he saw controversial Ghanaian preacher, Bishop Daniel Obinim, in Heaven. The ‘Prophet’, who was speaking to his congregation, said not even the English-speaking pastors believed to be ordained by God could make it, but that he saw the most criticized Obinim in heaven. “The hand of the Lord came upon me this dawn and took me to heaven and among the people I met in Heaven I saw Bishop Obinim in heaven,” he revealed. Bishop Obinim has on various occasions insisted that he was ordained by God to do his work, but his teachings and miracle business has gotten majority of Ghanaians thinking otherwise. The founder of the International God’s Way Church is known for dishing out lotto (gambling) numbers to his congregation. Interestingly, Nigel, who claims to be against gambling, cautioned his congregation against judging the Bishop. “I am against him giving out lotto numbers but don’t judge him. We shouldn’t condemn him,” he stressed. He further ‘revealed’ that doom will befall Ghana in March next year, and called on Ghanaians to pray for the country.